A WONDERFUL SILVER CAST MODEL OF YOUNG BACCHUS SEATED ON MEKONG STONE. 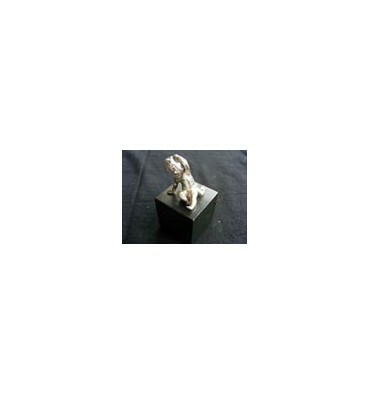 This beautiful solid sterling silver figurine mounted on Black Stone is very charming. The silver figure carefully cast in our Chiang Mai silver factory and the mineral stone plinth in one of our jade factories. The figure weighs 56 grams of solid silver the plinth is 224 grams of Mekong stone. A marvelous vitrine piece or very useful as a desktop paper weight. Total weight about 280 grams or 9 ounces. The over-all height is approx 8cms or 3 3/8th inches. Free, Worldwide registered delivery includes a smart box, full insurance and our complete 30 day replace or refund warranty. He will make an ideal present for more or less any occasion; in fact we can gift wrap him for you and send him direct to the recipient at no extra charge. He requires no visas to travel or work permits and although extremely self indulgent he will settle almost anywhere he feels loved. He will become a much loved family heirloom and that suits him just fine.